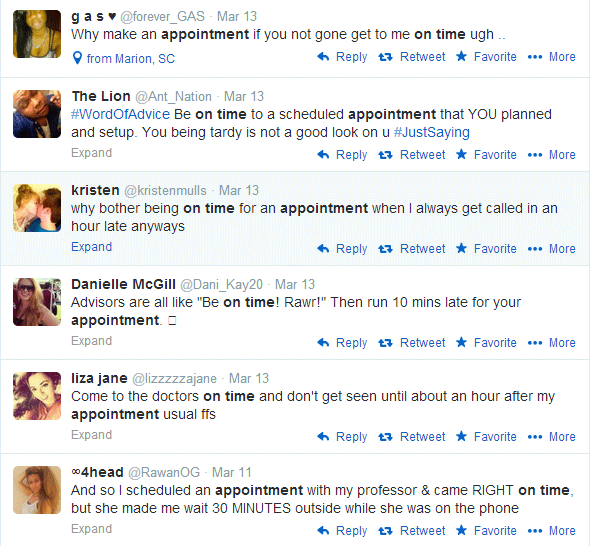 How often are your clients or customers late for appointments? You schedule a customer to come in at 3pm for an appointment and it’s now 3:04pm. You’re standing there staring at the door, looking back to the clock, and back to the door, and so on. It’s now 3:10pm and you’re starting to wonder if your customer is just late or if they are not coming at all. You’re starting to get a little angry. Now you’re getting very angry. Now you’re in a bad mood whether your customer shows up or not. Now let’s flip that situation around. You’re a customer and a service provider schedules you an appointment at 3pm. They send you an sms appointment reminder at 3pm the day before. You show up to your appointment at 2:55pm, 5 minutes early. It’s now 3:10pm and you’re still waiting in the waiting area for your appointment to start. 3:15pm rolls around and you’re starting to wonder if the business forgot about you. By 3:25pm you’re pretty angry that you showed up on time for your appointment when your service provider can’t do the same. You’re now in a bad mood, and way more likely to have a bad experience with that business just because you’re already angry before your appointment even starts. How often do you put a sour taste in a customer’s mouth before even beginning their appointment? In 2014 where there are always 50 other competitors doing what you do, customer relationships is what can set you apart from the rest. Don’t damage a relationship before it starts. Think about it.